Last modified 11 March 2018. This page serves as a consumer’s reference for finding public domain or alternatively licensed content — primarily through Creative Commons (CC). This is also a resource for creators interested in producing innovative, artistic works outside of conventional copyright licensing — namely remix culture and transformative works. This post also has some overlap with fair use, DMCA/DRM, and open access, so check out those as well. Code of Best Practices in Fair Use for Online Video (June 2008), prepared by CMSI, offers guidelines to creators to make licensing and obtaining permissions clear for users. Copyright, Creative Rights, and Comics: A Brief History (March 2018), a presentation by comics blogger Johanna Draper Carlson. Creativity Delusion: There Is No Genius (February 2018) is a pointed video that breaks down the misleading notion that great ideas come suddenly and to only a select few. In other words, while there might be rare moments of inspiration, most works require much time, effort, and experimentation. Everything is a Remix: Fair Use (September 2017), a video by Kirby Ferguson, describes how you can reuse copyrighted material within the bounds of fair use — i.e., for the purpose of commentary, parody, or criticism. Free Audio Books: Top 8 Websites, from About.com — some are in the public domain, some are DRM-free. Landmark release (D. Peters, 11 October 2017) of the Termination of Transfer tool from Creative Commons and Authors Alliance lets creators — authors, artists, musicians, photographers, videographers, etc. — reclaim copyrights from publishers, studios, and so forth. New Media Rights is a non-profit project to educate both creators and Internet users on licensing. The offer the online Fair Use App aimed specifically to guide filmmakers and video artists in understanding licensing, copyright, and fair usage. Ithaca College Library has a great guide to public domain works for audio, music, scores, images, film, and books. University of Montana also has an excellent pathfinder for public domain items for many media. Books: 39% of HathiTrust’s content is under public domain; licensing state is noted under Viewability in their catalog. Project Gutenberg has one of the largest repositories of public domain ebooks, available in multiple formats, too. For persons with print disabilities, Bookshare and Learning Ally offer ebooks, audiobooks, and Braille books. Comics: Digital Comics Museum and Comic Book Plus offer many public domain Golden and Silver Age comics. Creative Commons Search: Although not a search engine, this tool offers a one-stop place to search for CC-licensed content, based on media and organization (Wikimedia, Google, YouTube, etc.). Eezy.com provides repositories for both creators and users to upload and download CC-licensed works, respectively: Vecteezy for vector art; Brusheezy for Photoshop brush styles; Videezy for high-definition stock footage and videos; and Themezy for website and email templates, including WordPress themes. Free Music Archive offers CC-licensed music, under the direction of public radio station WFMU. The Getty Museum offers art books to download for free, fair use by students, educators, and researchers. The Google Cultural Institute has digital collections whose images are either copyright-free or copyright-cleared. You can virtually explore many well-known museums, world heritage sites with maps, performing arts pieces, and more. The Internet Archive has many free items across media types, including text, images, audio, video, software, etc. The Noun Project offers CC-licensed as well as public domain icons you can use. Open Music Library provides open access to journal articles, music scores, and books on music — developed by Alexander Street Press. Podiobooks offers books as serialized, CC-licensed audiobooks, in a podcast-like manner. Flickr search by license, from the dropdown menu on the left. 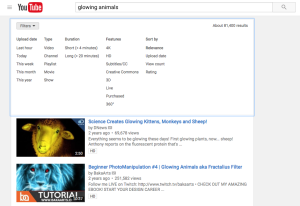 Filter video licenses from selections in the lower-left of search results. 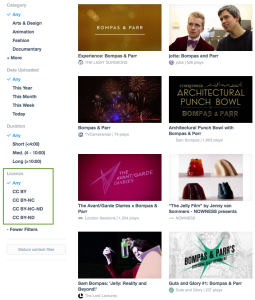 Filtering search results for CC-licensed videos in the upper dropdown menu. Audiobooks: Downpour and My Audiobook Library. Comics: ComiXology, one of the largest digital comics vendors, offers some DRM-free titles. Ebooks: More and more publishers and online bookstores are offering DRM-free ebooks! Safari tech books, Smashwords, Book View Café, Weightless Books, even the Tor imprint of MacMillan, one of the Big 5 publishers. For a comprehensive listing, see Defective by Design’s Guide to DRM-free Living: Literature, as well as Kevin Boynton’s list of DRM-free E-Bookshops (and comics vendors). Music: Both Apple iTunes and Amazon Digital Music sell music without DRM. eMusic offers DRM-free music as a subscription service. The Open Access article has resources still applicable to transformative works (including remixes), such as Creative Commons. However, as an alternative to CC, the Copyleft Guide discusses the background and uses for their licensing, including the history the GNU General Public License (GPL). Furthermore, there are many free and open-source licenses to select from, especially with regards to software. How to Publish an E-Book: Resources for Authors (J. Friedman, 28 October 2015) offers resources for creating and distributing your own ebooks. Let’s Get Digital: How to Self-Publish and Why You Should (2nd edition, 2014) is website for David Gaughran’s eponymous book of self-publishing. 3D Model Repositories list collections of 3D plans, including file types and availability, e.g., CC, GPL, paid, etc. 3D Printing Resources, a subject guide from the UCLA Knowledge Base. Lessons Learned Creating Sustainable, Deployable, Open-access 3D Printing Services (PDF), by Eric Maslowski at the University of Michigan Library. Make: Ultimate Guide to 3D Printing 2014 (M. Frauenfelder, 2013, O’Reilly Books/Maker Media; updated annually) offers thorough reviews of printers, scanners, extruders, and controller software. Some open source printer manufacturers are Ultimaker, Reach, and Kossel Pro. MakerBot, a commercial firm, builds 3D printers and offers a searchable community, Thingiverse; they encourage makers to make their 3D designs available through CC. MakerBot’s intellectual property (terms of service) extends to their services and patents, and end-user license agreements (e.g., EULA on the printers they sell; legal details). N.B. MakerBot’s hardware has become closed-source (C. Thompson, 30 May 2012), while some of the software and Thingiverse collaborations remain primarily open-source (Wikipedia). Shapeways is another commercial firm, except they focus on providing 3D printing services for uploaded models and designs with a wide range of physical media (plastic, metal, etc.). Their content policy specifies publicly accessible designs as licensed via CC, or through a worldwide, royalty-free, nonexclusive license. Fan fiction (fanfic) is a diverse, growing medium of enthusiasts, consisting of both amateur and professional creators making transformative works. 15 most post popular fan fiction sites (P. Kowalczyk, 15 July 2015) includes non-commercial, non-profit, as well as commercial resources — such as Archive of Our Own (AO3) and FanFiction.net, both which utilize a worldwide, royalty-free, nonexclusive license for user submissions. Creativity, Fan Fiction, and Fair Use is a free ALA CopyTalk webinar recorded on 5 November 2015. Organization for Transformative Works (OTW) is a non-profit supporting fan-created works and fandom (fan cultures). Finding media & producing creative works by Sarah Liberman is licensed under a Creative Commons Attribution-NonCommercial-ShareAlike 4.0 International License.